We were so honored to see our work featured in glossy print in Grace Ormonde Wedding Style Magazine. The Spring 2017 edition issue highlighted unique and innovative design thinking in their “Invitation Special.” We were thrilled that two of our favorite suites – “The Journey” and “The Ebell”, were included alongside the work of the industry’s top creatives! The Journey was created to evoke the glimmering allure of travel for Anne & John’s gorgeous Tuscan destination wedding at the beautiful Casa Cornacchi. To honor her global community of friends and family, we drew flight paths of many of the guests and the bridal party across the map folio, finished in luxe gold foil on a shimmery rich ultra-violet background. 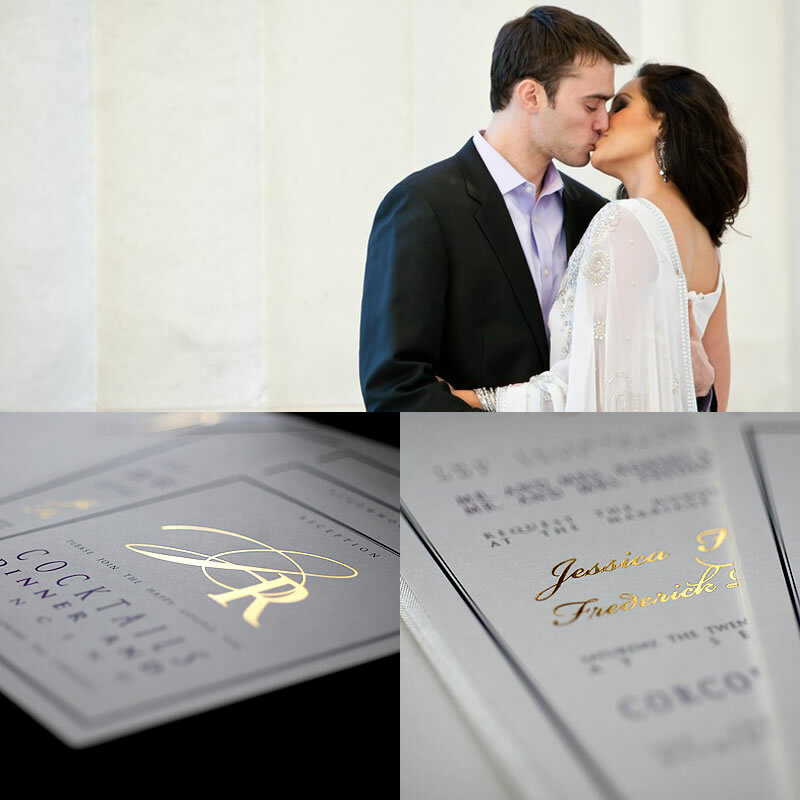 The invitation enclosure was an elegant boarding pass design with a custom old-world inspired monogram. Also tucked inside the folio was an information enclosure with a classic compass illustration, and an RSVP set. Everything came together inside an ultra thick shimmery frosted gold envelope that was custom made. This design was created for my own sister’s wedding and so it was especially meaningful. With a chic, East-West aesthetic, I wanted to infuse the beauty of sunset views through latticed windows in Eastern palaces and still reflect a modern, Western look. The square pocket was laser cut with a botanic design and gold foil pressed quote to set the tone for the wedding at the Ebell of Los Angeles. The invitation was printed in classic cream & aubergine with ombre enclosures and diagonal edges to create a dynamic layered look. “Life Without Love Is Like A Tree Without Blossoms Or Fruit.” These words from 19th-century poet Kahlil Gibran captured the essence of the wedding itself as a celebration of love and life.